Where have all your magnets gone? 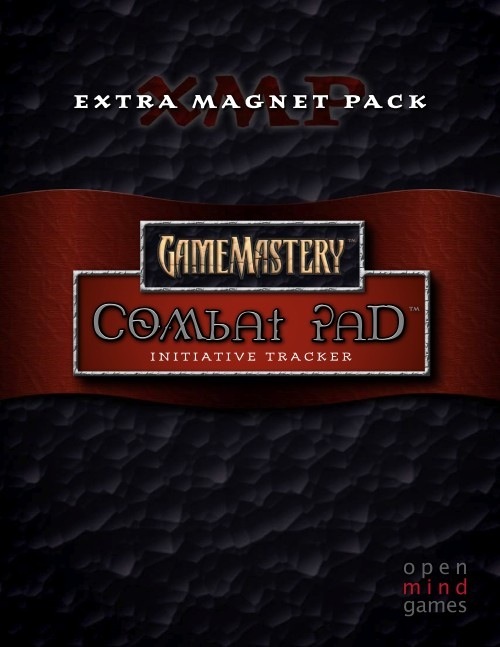 Replenish your dwindling supply of GameMastery Combat Pad magnets! Extra Magnet Pack makes it possible to orchestrate epic battles—or simply replaces missing magnets! Use a wet- or dry-erase marker to write PC, NPC, and enemy names on blue, green, and black magnets respectively. The turn arrow magnet clearly shows who is next, so you’ll never accidentally skip someone again. The round arrow points to the current round number, so you’ll know exactly where you are in combat. For most fights, the set included with the pad will suffice, but I find it useful to have spare. If your group is unusually big, or has a lot of companions (eidolons, animal companions etc.) you might want to purchase this pack with your combat pad. 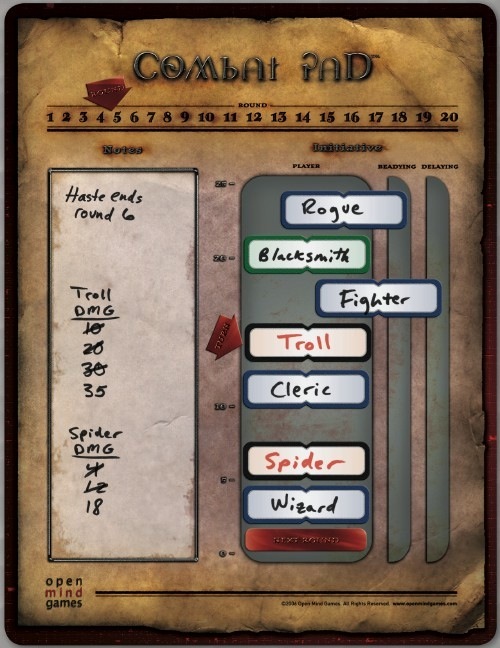 This extra pack of magnets for the Game Mastery Combat Pad is very helpful for keeping track of battles with many foes, keeping track of a lot of status ailments, or anything else you need to jot down and move around the board. 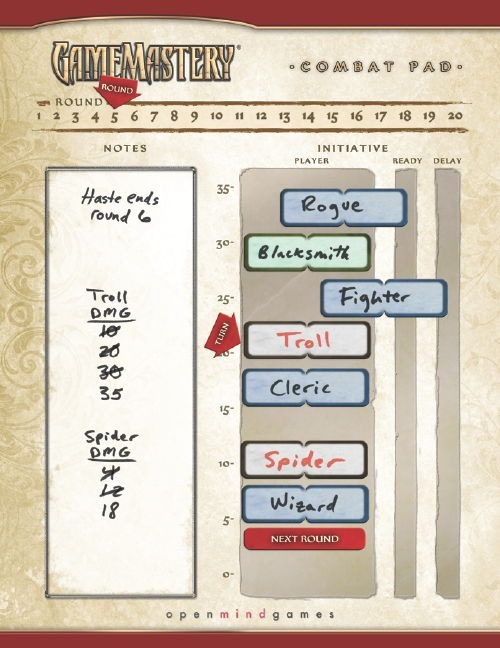 Very handy for large groups if you are using the Combat Pad, or if you just want the magnets to throw on a white board to keep track of the order your PCs, the BBEG, and his minions go in. Just curious - is this product still on schedule for August? Yep. They should be arriving in our warehouse this week, so they should also be at retail in another couple of weeks. The Combat Pad, itself, is no longer available (as of 4/5/10)? I don't know if they've set any dates yet, but it's apparently undergoing revision before more are produced. You are correct! I don't have any dates, as this product is actually produced under a license, and in this case, the licensor is responsible for manufacturing. As soon as he tells us when it's arriving, we'll put up the new version. Have you released the "changelog" yet? When we put up the new version, you'll see the new design... it's just a facelift, not a radical change to the way things work. Does it really need a facelift? I mean, as is, it's probably the most useful, and paper friendly, product in my set of DM tools. Need? No, it doesn't *need* one—but the new design does use space a little bit more efficiently, and ties in a little more with the current look-and-feel of our products. I don't expect that everybody's going to pitch their old ones in favor of the new ones, but I am glad we took the effort to tweak it a bit. So then, it will still be compatible with v3.5/Pathfinder? And is there any further updates on the new release date? No news yet on the release date. As for the graphic redesign—it's just visual. The mechanism isn't changing in any way, so it works as well as it ever did for any game, be it 3.5, Pathfinder, 4th Edition, or any other game that tracks initiative. Still no news on a release date for the new Combat Tracker? Could you speculate whether it is held until GenCon? We're awaiting an update from our partner. At this point, I doubt that having them at Gen Con is a possibility. When I get those magnets, will they be the new ones? The actual magnets didn't change all that much in the Combat Pad redesign, and the Extra Magnet Pack hasn't changed at all. They haven't? On the picture of the new pad, they look different to me. More easily distinguished because not only the borders have different colours, but the background as well. The magnets have changed subtly, but not dramatically. If we ever have to reprint the Extra Magnet Pack, we'll probably update them... but that won't happen for *years*. I see it now. I think the lighter colouration of the pad itself made the difference in the magnets seem more extreme than it is. Still, the new magnets seem to have a more uniform colouration, while the old ones have a gradient blending into white as it nears the centre. That could be the pics again, though. It's not just the pics—that's apparent in the actual products, too. Ah, nice. That's the thing I noticed as soon as I saw the new pictures. That's the reason I'd be interested in the new magnets. The old pad itself is fine, though, and I'm not sure I want to buy a complete new set just for the magnets. any idea yet on when this will be available again? 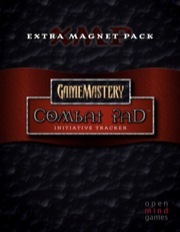 The Extra Magnet Pack is currently available, but we're waiting on a reprint of the Combat Pad. Sorry if this has been answered elsewhere--is there a tentative date yet on this item being back in stock? Thanks! The Extra Magnet Pack is still in stock. The revised Combat Pad is still a few months out. any update on when the combat pad will be out? I don't have a specific date, but very, very soon.